In this first book, four children ~ Lucy, Edmund, Peter and Susan ~ move in with an old professor during the war. While playing one day, Lucy hides in a wardrobe and discovers a new world on the other side. Eventually all four children make it through to Narnia and discover that they have a significant role to play in this new world. The evil White Witch has put Narnia into an eternal winter, and the Great Lion Aslan has returned to restore order to Narnia. There are all sorts of animals and creatures, including beavers and fauns and dwarfs and giants, some who help Aslan and the children, and some who fight on the side of the witch. I have to admit I was not nearly as taken with this book as I thought I would be. What bothered me the most was the overt religious message. I had heard there were Christian undertones in the book, but in my opinion, these were much more than that. The biggest annoyance was the fact that the children were constantly referred to as Son of Adam and Daughter of Eve throughout their entire time in Narnia. I could understand the reasoning for it when they first got there, but after that, just call them by their names! And then there was the whole crucifixion... I'm not against Christian messages; I just found it entirely distracting and it took away from my enjoyment of the world of Narnia and the story. Overall, I liked the general idea of the book; I just wasn't crazy about the way it was written. I didn't feel a connection or compassion for the characters and I wasn't drawn into the story as much as I had hoped. I'm guessing I would have enjoyed this book much more as a child. I plan to read Prince Caspian next, and hope that I enjoy that one a bit more. This review is based on a copy of The Lion, the Witch and the Wardrobe that I purchased. Having read the series several times, starting as a little kid, I've always loved it. I admit though that when I read it again a few years ago as an adult, the Christian themes really stuck out. They are stronger in some books than others. The Boy and His Horse is really bad because the "bad guys" are very clearly Muslim. Yikes! In the last book, not having read the Bible, but knowing the general gist of Revelations, it's seriously the end of the world, judgement day. I really have to just focus on the fantasy, but yeah, those things bothered me a lot this last time. First, kudos on the blog site & reading encouragement. Regarding C.S. 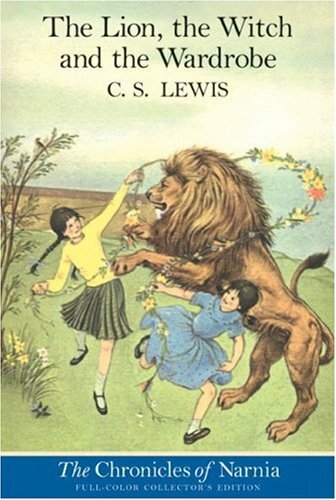 Lewis, in interviews he has stated plainly that the Narnia books were meant to be a Christian allegory. Interestingly Philip Pullman, author of the children's book "The Golden Compass" has stated it was written to present an atheist message to children and as a rebuttal to C.S. Lewis. For me, knowing about the author and their motivations for writing is one of the most important factors in choosing a book. Wow, I'm surprised to hear you didn't enjoy it more, Julie. This is one of my all-time favorite books in one of my all-time favorite series but perhaps that is because I read it first as a child. My 2nd-grade teacher read this book aloud to my class, and I was hooked! I immediately went to the school library and tore through the rest of the series. About 5 years ago, my husband and I read the entire series aloud to our sons, and they loved it, too. I have always just ignored the Christian references and enjoyed it purely as a good story. I am not particularly religious (I consider myself spiritual but have not attended church regularly since early childhood), so perhaps that was a benefit in this case! I'm sure many of the Christian references even went over my head. I hope you enjoy the rest of the series and are able to get past this problem and just enjoy the stories. The Voyage of the Dawn Treader is another favorite of mine. And the movie adaptations are surprisingly good!